When I first visited St. Maarten, cruise ships anchored in the waters outside of the Great Bay and tendered passengers into Philipsburg. Now, the ships dock at a purpose-built cruise port outside of town. While there are a number of shops in the cruise port complex, Philipsburg's famous shopping district is some distance away. Similarly, there is no beach by the cruise port. The good news, however, is that it is relatively easy to get to Philipsburg, its shops and beach from the cruise port. The cruise port in St. Maarten centers on two long piers, which run parallel to each other. Guests coming off ships docked at either of the piers are channeled into a large plaza that has shops and stalls around its periphery. With your back to the piers, the water taxi terminal is on the left hand side following the line of shop stalls. Look at it another way, the water taxi terminal is on the opposite side of the plaza from the large ocher color building with the statue in front. The water taxis are open motor launches that hold about 50 people. They are equipped with a canopy to protect the occupants from the sunshine and occasional tropical shower. The boats run fairly frequently during the day between the cruise port and two locations in Philipsburg. The first location is called Uptown and is at Bobby's Marina, which is by the near end of Great Bay Beach. The second location is referred to as Downtown and is the Town Center Pier. As the name suggests, this location is in the canter of Philipsburg with the pier essentially dividing Great Bay Beach in two. For seven dollars, you can ride all day on the water taxis. There are also one trip fares but the all day price is the most economical if you are going to make more than one trip. 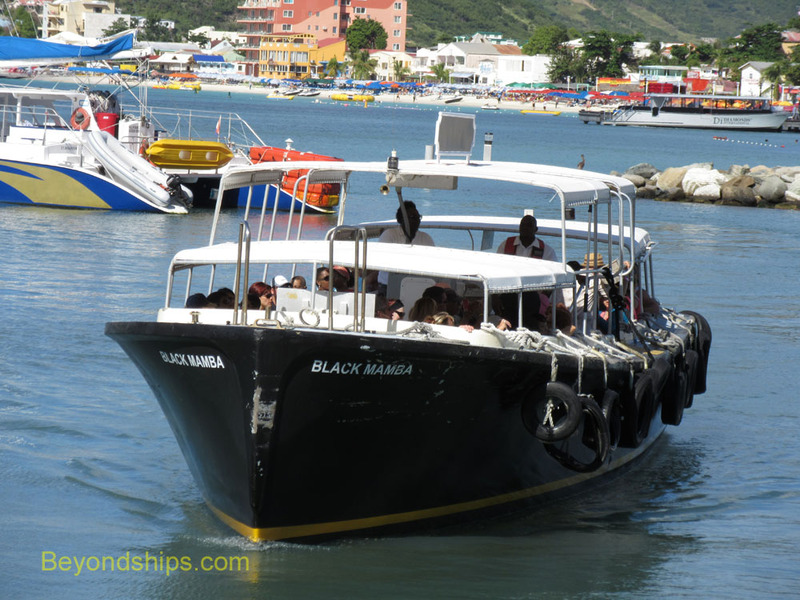 While most cruise passengers take the water taxi, it is also possible to get to Philipsburg by land, either by taxi or on foot. For either of these alternatives, walk past the big building with the statue in front and turn right at the sign saying “taxis.” You can also go further down the pedestrian mall that has shops on either side. Near the end of this street another pedestrians-only runs into it from the right. Turn right and follow this short street until it runs into a large traffic circle. In the traffic circle, there is usually a line of taxis looking for fares. However, as the day progresses and the taxis find fares, the number of taxis waiting in the traffic circle decreases. Immediately outside of the gates of the cruise port, you will usually find another group of drivers offering to take visitors on tours. However, a sign by the gate warns that the drivers outside the cruise port are not regulated and that visitors use them at their own risk. If you are up for some exercise, it is not a difficult walk to Philipsburg. Turn left and follow the traffic circle until it meets the entrance road for the cruise port. Turn left again and go through the security check point at the gates of the cruise port. Pass through the group of drivers offering tours and turn left onto the sidewalk. At this point, the sidewalk is a charming path. There are tall palm trees shading it and grass bordering it on both sides. As of this writing (2015), there is construction going on a little way further down the road on the left side. However, a fence separates it from the sidewalk. On the right hand side, a busy road takes automobile traffic into and out of Philipsburg. A steep hill rises up from the road on its far side. Perhaps because of the slope, it is undeveloped and is covered in vegetation most of the way into Philipsburg. However, the road and the hill are only relevant as scenery, you do not cross the road or go up the hill. Continuing along the sidewalk on the left hand side of the road. The palm trees and the grass border eventually disappear. A metal barrier separates the sidewalk from the road while on the other side, a fence divides the sidewalk from commercial boatyards. Along this stretch, you pass a parking lot with a tavern, some shops and a life-size statue of a cow. Not long after this, you come to an entrance to another parking lot. A sign directs you to turn left as this is the way to downtown. Indeed, while it is possible to follow the road into town, turning here is a quicker and more pleasant way to get to the heart of Philipsburg. Follow the sidewalk as it skirts around the rectangular parking lot. At the corner diagonally opposite to the entrance are a group of pleasant-looking shops that form a pedestrian mall. Turn left and walk through the mall. You are now in the Bobby's Marina area. At the far end of the short pedestrian mall is the marina with pleasure boats and yachts moored in long rows. By the water is a wooden shelter with benches. This is the Uptown location where the water taxi drops off and picks up passengers. To proceed onward into Philipsburg, go across the stone Renaissance-style bridge to the right of the water taxi shelter. On the other side, you soon come to a gateway by a monument that features an anchor and a 18th-century cannon. This is the beginning of the Boardwalk, which runs along the seaward side of downtown Philipsburg. Despite its name, the Boardwalk is not a wooden path but rather a wide paved sidewalk. At this point, it is shaded by tall palms. Tables and chairs from the nearby bars and restaurants have been placed under the palms on the left hand side. In addition to the bars and restaurants on the right hand side are shops and stalls. The Boardwalk quickly opens out onto the great sandy expanse of Great Bay Beach. Before the cruise port was built, this beach was a tiny strip of sand that sometimes washed away during a hurricane. Sand dredged from the seafloor in order to construct the cruise port was placed here, creating a wide impressive beach. A number of entrepreneurs rent umbrellas and sun loungers along the water. Opposite the beach on the right hand side of the Boardwalk are bars, restaurants and stores. In among them are a few small hotels and the interesting looking Saint Maarten of Tours church. About half way along the Boardwalk, you come to Town Center Pier. This is the Downtown terminus of the water taxi. On the pier are a few shops and a police station. Saint Maarten's main shopping district is not the Boardwalk but rather First Street, which runs parallel to the Boardwalk one street inland. Several alleys and passageways connect the two streets. However, the most interesting connection is the wide, palm-lined plaza that runs between the Town Center Pier and the historic Courthouse. First Street is a narrow street lined with shops. It is primarily a pedestrian thoroughfare but there is an occasional car or truck. You also have to beware that the pavement is sometimes uneven. Quite a few of the stores have people standing on the street hoping to steer customers into the stores. However, they are not aggressive and do not pursue the matter if you indicate that you are not interested. There is a visible police presence in downtown Philipsburg. Indeed, I have seen officers patrolling the Boardwalk and First Street on segues. In addition to the stores in downtown Philipsburg, there is a large open-air market located behind the Courthouse. To return to the cruise port, you can take the water taxi from either the Town Center Pier or from Bobby's Marina. Taxis can often be found in front of the Courthouse. To walk back, simply re-trace your steps. It generally takes me 20 minutes to a half hour to walk between the Courthouse and the cruise port. 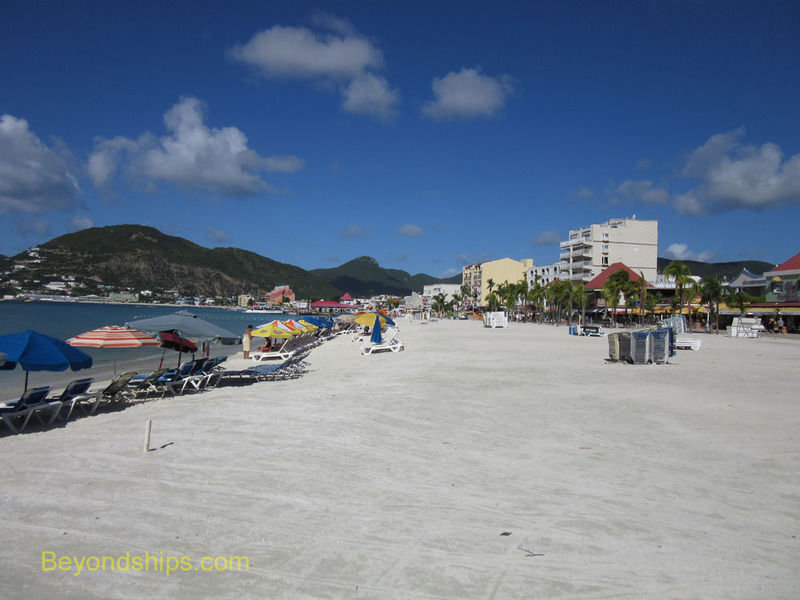 Cruise destination article - - St. Maarten - - Getting to Philipsburg by land and by sea.